On September 1, 1939, Germany unleashed their armies against Poland in a new style of warfare called Blitzkrieg and, after a vicious but relatively brief fight, overran the country, with an assist at the end from Russia in the east. The Poles fought valiantly but were undone by bad defensive terrain, superior numbers, the high intensity pace of Blitzkrieg, and a total lack of support by their allies, Britain and France. 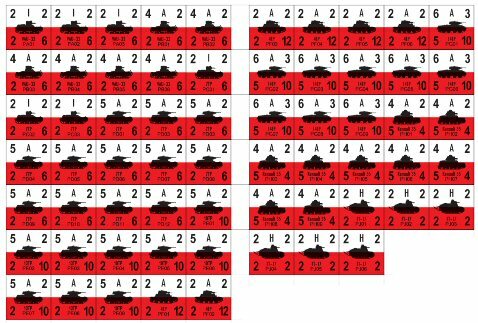 Below is a half sheet of Polish tanks with armor factors adjusted down to numbers as calculated by the original formulas as set forth by Alan Arvold. These are for use against the German tanks available on the Czech page. Note that these counters are a supplement to the ones on Ward's site and are for use when using the adjusted German tanks on this site. Many thanks are due to Byron Henderson for his tireless work in formulating the values on these counters. Please use the link below the picture to download the full resolution file in zipped PDF format. German propaganda in 1939 depicted the invasion of Poland as an example of Germany's new form of highly mechanized warfare and history has generally recorded it that way. The newsreels show everybody in a motor vehicle of some sort zooming down the road and we are given the impression that the whole army is mechanized. The truth is somewhat different. Germany had only five full Panzer Divisions along with four Light divisions (with half the tanks of a Panzer division). The tanks were almost all Panzer I and Panzer II with just a few Panzer III and Panzer IV thrown in. Though on paper the infantry in the armored units rode in halftracks, in actual fact halftracks were very rare and trucks carried the soldiers. There were only four Motorized infantry divisions and they rode in trucks or on motorcycles. The Infantry divisions (about 85) composed most of the Wehrmacht and they traveled the same as they did in WWI, by foot and horse. Below are tables of organization for the two armies for use in PB/PL. I hope that people will find these useful when building scenarios to help accurately represent the proper unit organizations and equipment for this campaign. Each link is a PDF file.